Apple Stores are down for updates. 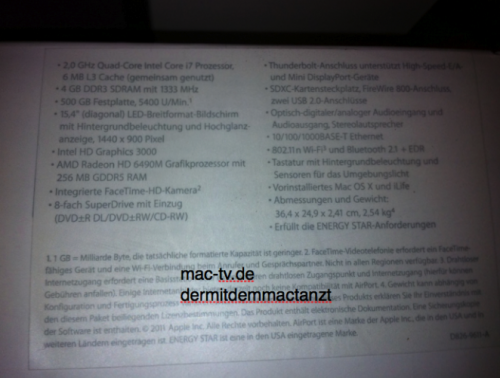 Here are leaks of some of the new 15" and 17" MacBook Pros. 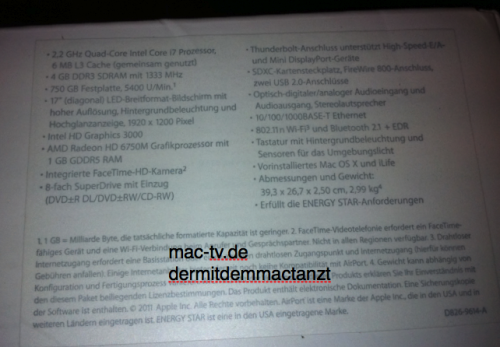 These images are from Mac-TV.de but have been confirmed. Apple has included Quad core CPUs into the 15" and 17" MacBook Pros for the first time. 3. 15" Display. 2.2GHz Quad i7. 4. 13" Display. 2.7GHz Dual i5. 4GB RAM. 500GB HD. 5. 13" Display. 2.3GHz Dual i5. 4GB RAM. 320GB HD. The full part numbers are listed here, provided by Mr.X. All models ship within 24 hours. No prices yet, but we expect the Apple Store to come back up by 8:30am eastern.